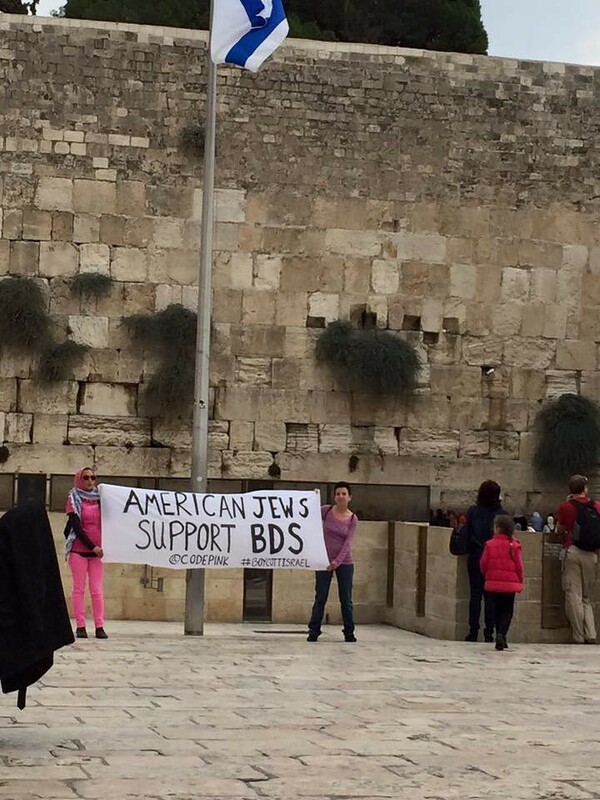 JERUSALEM - On Tuesday, November 10, 2015 at 11:30 am, Jewish Americans CODEPINK activists, Ariel Gold, of Ithaca, NY and Ariel Vegosen, of Oakland, CA, unfurled a banner near the Kotel (Western Wall) reading, "American Jews support BDS." Representing the women's peace organization, Code Pink, the activists goal was to express Jewish opposition to the Israeli occupation of Palestine and endorse the Boycott, Divestment, and Sanctions movement as a nonviolent strategy to bring about a just peace in Palestine and Israel. Gold and Vegosen were in Israel/Palestine for a week long CODEPINK delegation to the West Bank to participate in the Palestinian olive harvest . During their delegation, along with helping Palestinian farmers with their olive harvest, the group witnessed Israel's apartheid system of different roads, services, and laws for different people. They experienced major restrictions on Palestinian freedom of movement, the massive growth of illegal Jewish-only settlements on Palestinian land, and numerous human rights abuses against Palestinians. Israel/Palestine is currently experiencing a serious escalation of violence to which Palestinians are bearing the brunt of the casualties, injuries and arrests. From October 1 until now, Israeli forces have killed at least 78 Palestinians and injured an estimated 2,500 including unarmed protesters. At least nine Israelis have been killed. CODEPINK recognizes that the occupation is the root cause of all of the violence currently been seen in Palestine and Israel. On November 4, American Presidential candidate, Hillary Clinton reaffirmed her strong support for Israel and opposition to BDS. This week Israeli prime minister Benjamin Netanyahu is visiting the US and meeting with President Obama to request 5 billion dollars annually in aid for the next ten years, a 60% increase in US military aid to Israel. CODEPINK supports ending all military aid to Israel. Glad to see our Politicians in support of this and taking an active role.